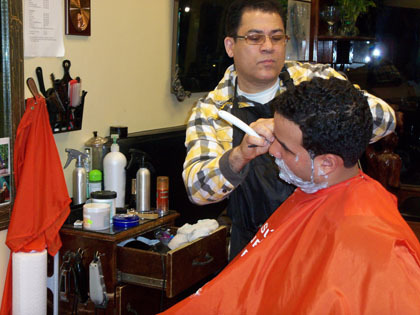 Fifteen minutes after he heard about the earthquake in Haiti, Dominican barber Jose Taveras said he made a donation to the Red Cross. Taveras was born in the Dominican Republic, a country that shares the island of Hispaniola with Haiti. But not every Dominican feels that way. Taveras admits the two countries have not always gotten along. He said the Haitian occupation of the Dominican Republic between 1821 and 1843 is a source of resentment between the two nations. Even so, the owner of Groom Team barbershop in Washington Heights insists any grudges between Haitians and Dominicans have been buried, at least in his mind. Dominicans in Washington Heights expressed remorse for the devastation and lives lost after the Jan. 12 quake, but some, unlike Taveras, did not paint a rosy picture of the current relations between the two countries. Victor Sangiovanni, whose father still lives in the Dominican Republic, says illegal Haitian immigrants in the D.R. are a continuing cause of frustration. The Christian Science Monitor estimates that, in 2009, between 700,000 and 1 million illegal Haitian immigrants were living in the D.R. Most, according to the Monitor, come seeking economic opportunities, often in the construction industry. Gomez said Haitians believe in voodoo and “worship the devil.” He stops short of claiming that practicing voodoo is what caused the earthquake, but he says Haitians must be careful who they pledge allegiance to. Contrary to Gomez’ assertions, a 2008 United Nations report on national religions found that only 2 percent of Haitians practice voodoo. Further, those who believe in Haitian voodoo do not typically worship the devil. The primary deity in the religion is Bondye, whose name is derived from the French “bon Dieu” or “good God.” The U.N. report found that 55 percent of those living in Haiti are Roman Catholic. Although he condemns what he claims are Haitian religious practices, Gomez said he made a donation to Catholic Relief Services, an international aid group contributing to the relief effort. Like Taveras, Gomez explains that geographical proximity fosters a feeling of brotherhood between the two countries. Doyanica Pineda bristles at the notion that God had anything to do with the disaster, which has claimed an estimated 200,000 lives. The nurse, whose family resides in the Dominican, said it was purely a matter of chance that Haiti was struck.